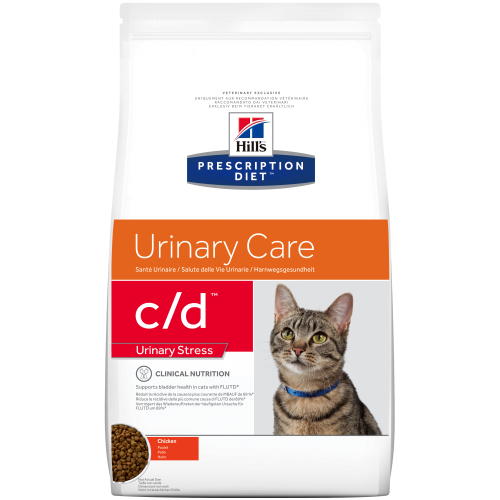 Prescription Diet c/d Urinary Stress is for cats prone to suffering with Feline Lower Urinary Tract Disease (FLUTD), and also helps manage anxiety, a risk factor for the common cause of FLUTD. It is recommended for initial nutritional management of cats with any type of Feline Lower Urinary Tract Disease (FLUTD), including crystalluria and/or urolithiasis from any cause, urethral plugs and idiopathic cystitis; dissolution of sterile struvite stones; long-term nutritional management of cats prone to: struvite, calcium oxalate and calcium phosphate crystals and uroliths (reduction of occurrence and recurrence); Urethral drugs (almost exclusively associated with struvite or calcium phosphate crystals) and Idiopathic FLUTD (especially c/d Multicare Feline Urinary stress pouch formulas). Nutrition clinically proven to reduce the recurrence of FLUTD signs. Contains L-tryptophan and milk protein hydrolysate to control stress, a known risk factor for the major cause of FLUTD.• Nutrition clinically proven to dissolve struvite stones in as little as 14 days. Target urinary pH helps discourage the formation and aggregation of struvite crystals without encouraging the formation of oxalate crystals. Water helps increase urine volume to dilute the constituents of all uroliths and reduce recurrence of idiopathic FLUTD. Formulas help increase choice to encourage acceptance. Vitamin E &amp; Beta-carotene helps neutralise free radicals to help combat urolithiasis. Vitamin C is a precursor for oxalate. Brewers rice, chicken (32%) and turkey meal, wheat, maize gluten meal, animal fat, digest, minerals, fish oil, vegetable oil, vitamins, DL-methionine, taurine, milk protein hydrolysate, L-tryptophan, trace elements, crustacean shell hydrolysate, cartilage hydrolysate. Naturally preserved with mixed tocopherols and citric acid. Beta-carotene 1.5 mg/kg, Calcium 0.0071, Carbohydrate (NFE) 0.405, Chloride 0.009, Chondroitin sulfate 920 mg/kg, Fat 0.156, Fibre (crude) 0.009, Glucosamine 1010 mg/kg, Magnesium 0.0006, Omega-3 fatty acids 0.007, Omega-6 fatty acids 0.0309, Phosphorus 0.0066, Potassium 0.0075, Protein 0.322, Sodium 0.0035, Sulphur 0.0064, Taurine 2350 mg/kg, Tryptophan 3479 mg/kg, Vitamin A 5780 IU/kg, Vitamin D 610 IU/kg, Vitamin E 600 mg/kg.